The Alexanders: New House Accomplishments!!! I am proud to say that we have accomplished a lot in the last 7 months that we have lived in our "new house" as Avery still calls it. :) A little over a week ago, we hosted a baby shower here at our house and that was our deadline to get a lot of our main projects finished. We barely made it by the skin of our teeth! There are still more projects to do, but here are some before and after pictures so you can get an idea of what it looks like around here. Looking back, we should have taken better "before" pictures and remembered where we stood so we could get the same angles in the "after" pics, but oh well. Also, a lot of these pictures are a little fuzzy and not the best quality, but you get the idea. 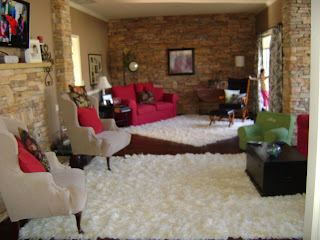 I will have to say my hubby did most of the work. 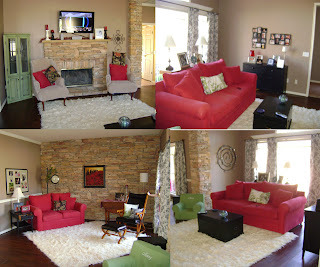 I did most of the decorating, and we both had a lot of help from my mom and our good friend Bart! 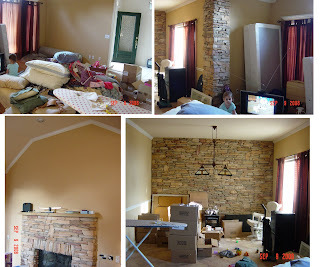 I won't inundate you with the scores of pictures of all the "during" work, but Craig basically ripped up the carpet in the living room and busted up the tile in the "formal" dining room side of what is now the large living room. 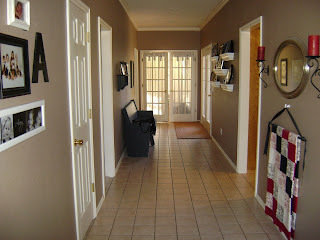 He then laid vinyl "wood" flooring--not real hardwood but it was cost effective, easy to install, and we love it! 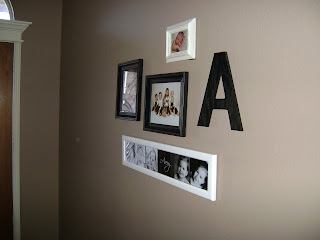 He and Bart painted the walls in the living room and entryway. 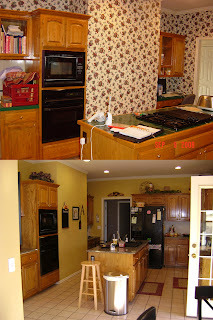 In the kitchen, we tore down the wallpaper (ok, Mom, you did this :), and Craig and I textured and painted the walls. Craig and Bart took out the old backsplash and Craig put up new drywall in its place. 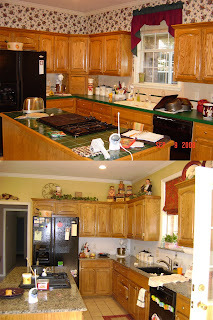 We had the old green countertops replaced with granite quite a while back. 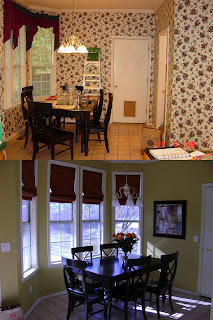 My mom made the drapes in the living room and I made roman shades in the kitchen. 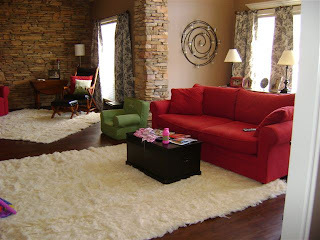 Furniture was arranged and rearranged a bunch of times and there were countless other little projects like recovering chairs, laying out rugs and rug pads, painting shelves, hanging pictures, etc, etc, etc. 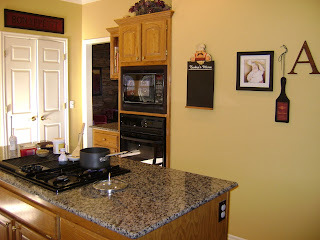 The main basic projects we have left are to lay the same wood flooring in the entryway and kitchen, do a new tile backsplash, and refinish the cabinets. 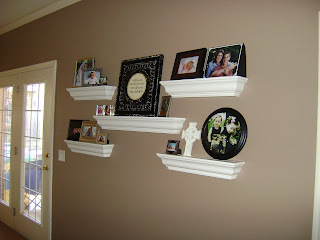 I want to do a creamy white color with the black stain in the crevases of the wood. Picture will explain that better in the future. Then we have to redo the hall bath and the master bath, but that won't be too bad. Anyway, I am so proud of Craig for figuring out how to do all of the work that was new to him. We did everything ourselves and we feel a wonderful sense of accomplishment in having done this! I would not have said this was a big "fixer-upper" house when we first bought it, but I guess it kind of was! So--more to come! WOW!!! It looks wonderful! I love all the curtains you did. The wood floors look fabulous. I can't wait to come see it in person. Not sure when, but hopefully soon. Well done, guys. All that hard work really paid off. Your home is beautiful! I wanted to ask if the flooring you put in was hard or if you learned anything that you could pass on. We are just about to put in some long hours on our fixer-upper that we just purchased and are wanting to put in laminate "wood" lock & click flooring and take down some wall paper....any helpful hints?